30 villagers from Sut Ra village and 10 villagers from Kawng Ra village in Njang Yang township who fled their homes to nearby forest are still unable to return to their villages. Sut Ra and Kawng Ra villagers are trapped in the forest as fighting between KIA and BA troops will likely continue in area around their villages. A combined force of about 100 troops from BA’s 37th LIB and 121st LIB launched an attack on KIA 22nd Battalion’s Kawng Ja Post on Nov 13. 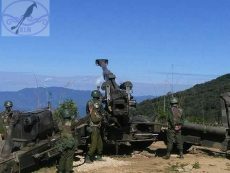 In northern Shan state, a series of battles raged between TNLA’s 876th Battalion troops and BA troops under 77th LID and 88th LID near Sam Bu in Nampaka township on Nov 14 and 15.